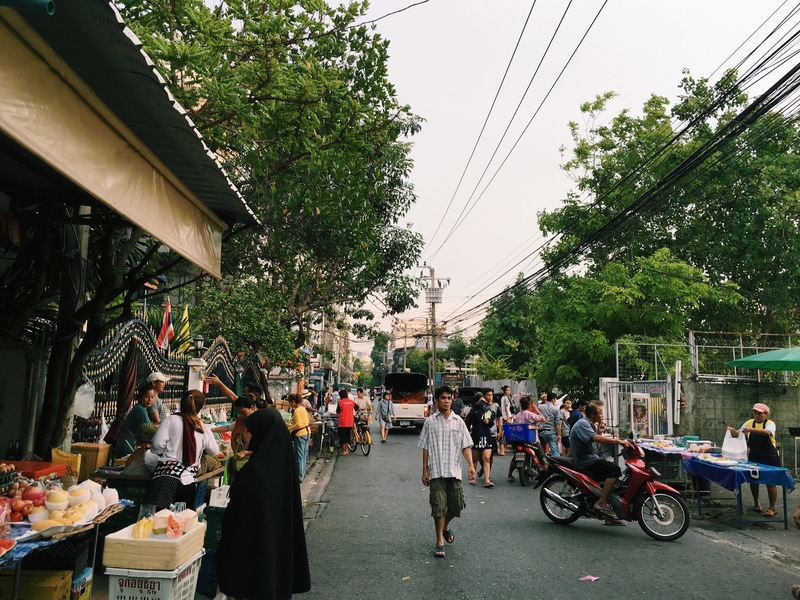 TL;DR – After hopping around, I’m back in Bangkok and running out of money. Well my hair seems to be falling out. Maybe it’s because I spent the past few days in Laos washing my hair with bar soap (thanks, shampoo-less guesthouse!) or maybe it’s because I’m stressing out about my financial situation. The money’s low, my dudes! No shock there, although it’s still somehow a shock. In my last post, I talked about hemorrhaging money. Instead of turning that around, I decided to not do that and keep on balling out of control. 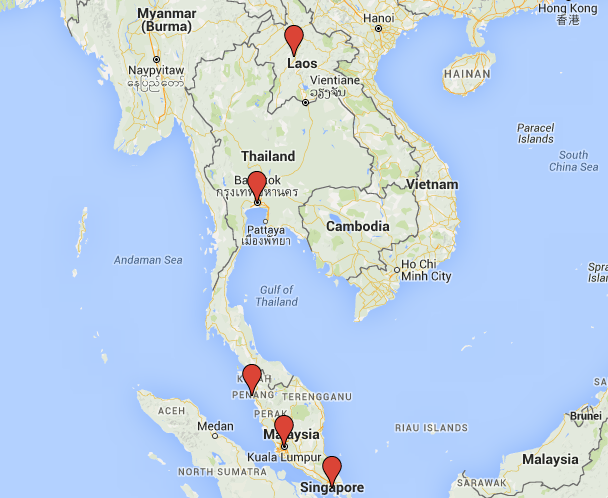 Going to Malaysia and Singapore did not help, and it didn’t help to go on a spontaneous trip to Laos either. Still happy to have those experiences, I guess? Allegedly I get paid on the 20th, so all should be well (for a while). 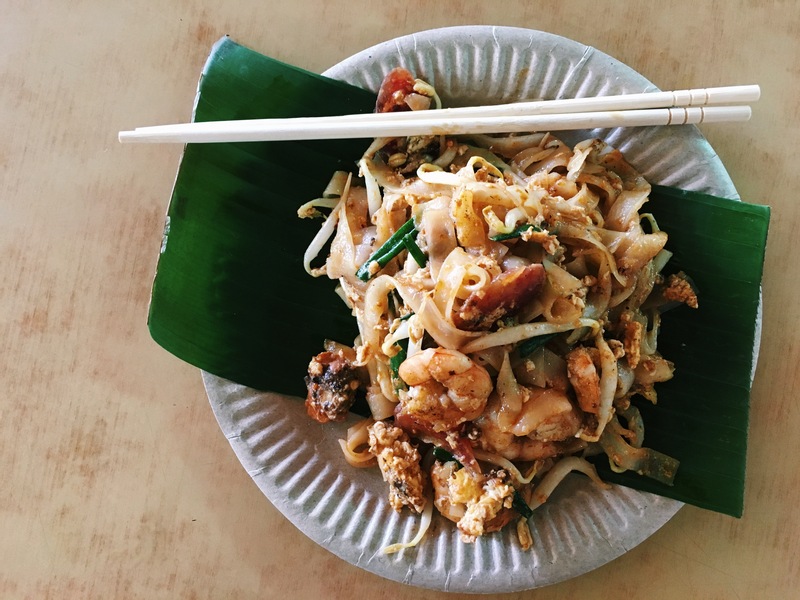 One of many delicious street eats in Penang, Malaysia: Char kway teow. Seeing Tame Impala in Kuala Lumpur was AMAZING. I’ve never been to a concert where so many people were diehard fans before. Everyone was screaming all of the lyrics, jumping and dancing like maniacs. Unreal. 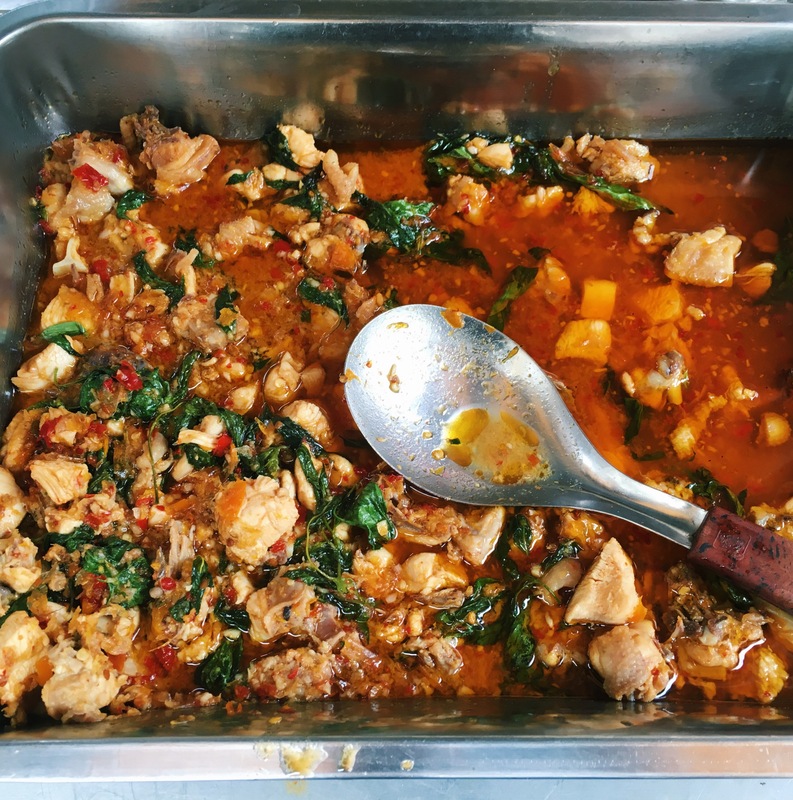 After a week in KL, I took the train to Penang where the joys of street food eating were only slightly lessened by the painful, painful heat. Singapore was a completely different ballgame. I loved how clean and modern it was, but it was way too expensive for a person of my means. Fortunately, a friend’s family opened up their home to me, even going so far as to cook me delicious Indian meals daily. I will be forever grateful for their kindness! I worked on some stories for Munchies and got the F out of the city as fast as possible. I moved into a little apartment in Bangkok for the month of May and love it. I seem to be an oddity in my new neighborhood. Not many foreigners, in these parts, so when I walk down the road, I’ll hear people say “Farang! Farang!”(foreigner) then turn to stare at me. At first it was a little off-putting, but now we have a neighborhood camaraderie going on. Everyone says hello, people ask me where I’m going, try to speak Thai with me. I wish I was staying here longer, it’s a fun community. The happenings of my temporary Bangkok neighborhood. I got back from Singapore just in time for RATATAT TO PLAY IN BANGKOK. 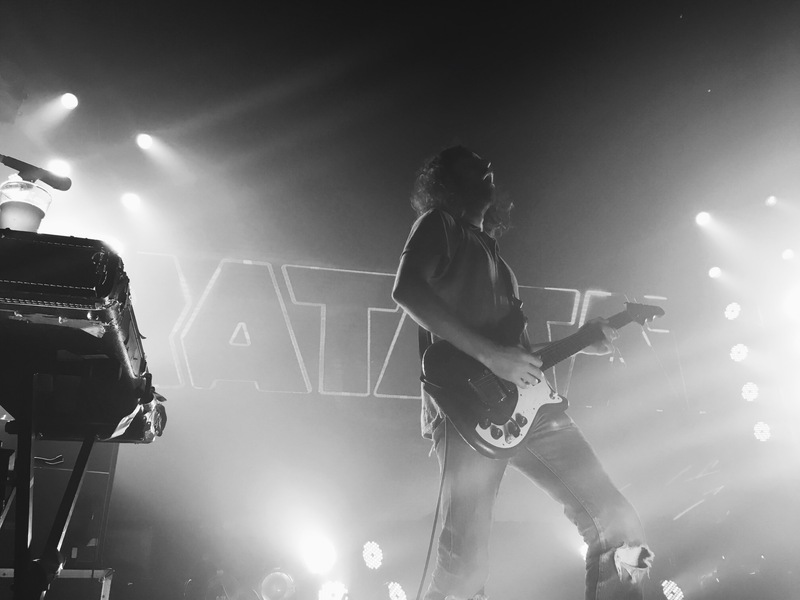 Even though Ratatat is one of my favorite bands, I didn’t realize how excited I was for the show until we arrived at RCA Live. We waltzed up to the front row, no one put up a fight. In fact, there was a huge space in the front, so huge that we wondered if people were allowed to stand there. It turns out, we WERE allowed to stand there, and we did! Ratatat warmed up in front of us, and I started losing my mind. RATATAT IS STANDING RIGHT IN FRONT OF ME, WARMING UP FOR A SHOW. Then the show started, and I lost whatever part of my mind was left. 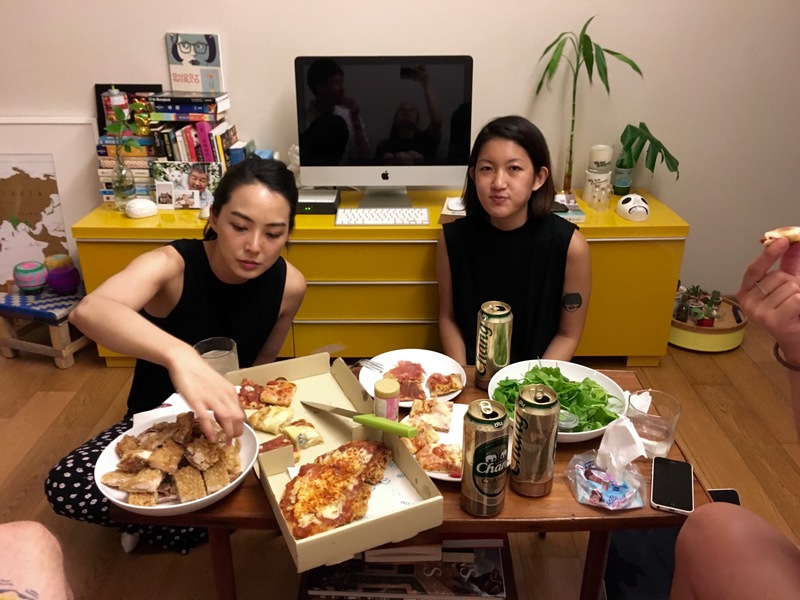 Pregaming for Ratatat with Korean fried chicken, pizza, and Thai beers. I’ve never had such a weird reaction to a concert. Because Ratatat doesn’t have any lyrics to their songs, and because I was SO SO SO SO SO SO EXCITED, I just started screaming. Lunatic fan screaming. “What is wrong with this person?” screaming. The rest of the crowd seemed to be pretty calm, perhaps wondering what the actual F was happening to the farang in the front row. WELL HI, MIKE STROUD. YOU’RE JUST STANDING RIGHT THERE, HUH??? After the show, as though it was the most normal thing in the world, I MET RATATAT AND DIED. Just had a normal conversation like no big deal. I don’t even remember most of what we talked about because of the adrenaline. I do remember Evan Mast mentioning going to a friend’s wedding in Sicily. I lost my voice from all of the wild screaming and could barely speak for the next four days. In between story writing and Ratatat fawning, I’ve been loving my newly-minted GuavaPass subscription. 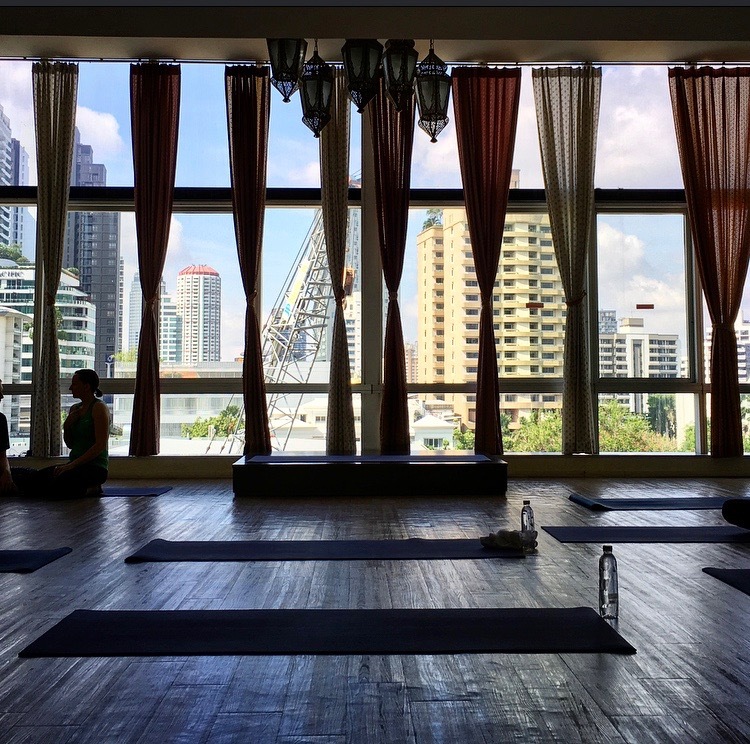 It’s like ClassPass in the US, but for Asia and Dubai. It’s allowed me to get into Muay Thai, get back into yoga, kill myself at kettle bell classes. The app is a life saver. There’s no way I’m working out outside in this heat, and I rarely walk anywhere. Without GuavaPass, I’d be a sweaty, sedentary blob. Yoga with a view, thanks GuavaPass! I’m still not sure if Laos was real. What I saw in Luang Prabang was unbelievable. 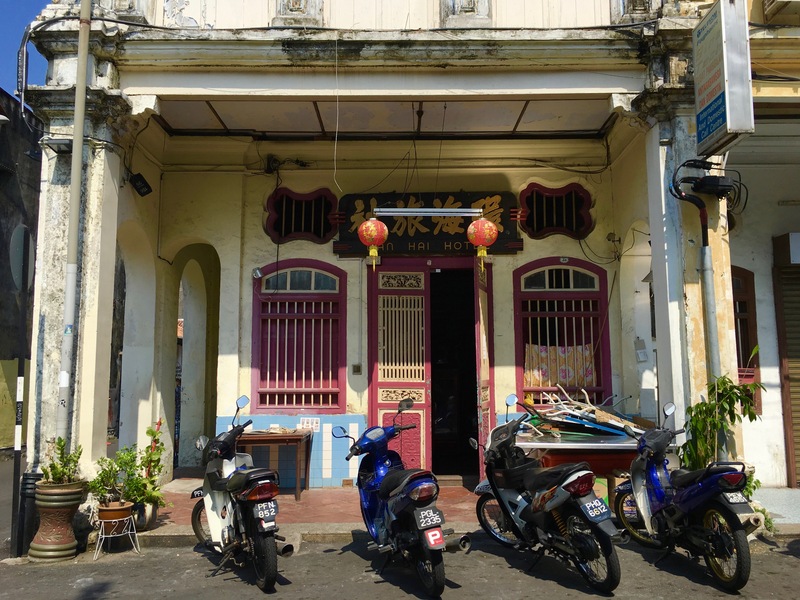 It’s an hour flight from Bangkok, but you feel like you’re stepping back decades. No skyscrapers, just lush scenery and a slower pace of life. 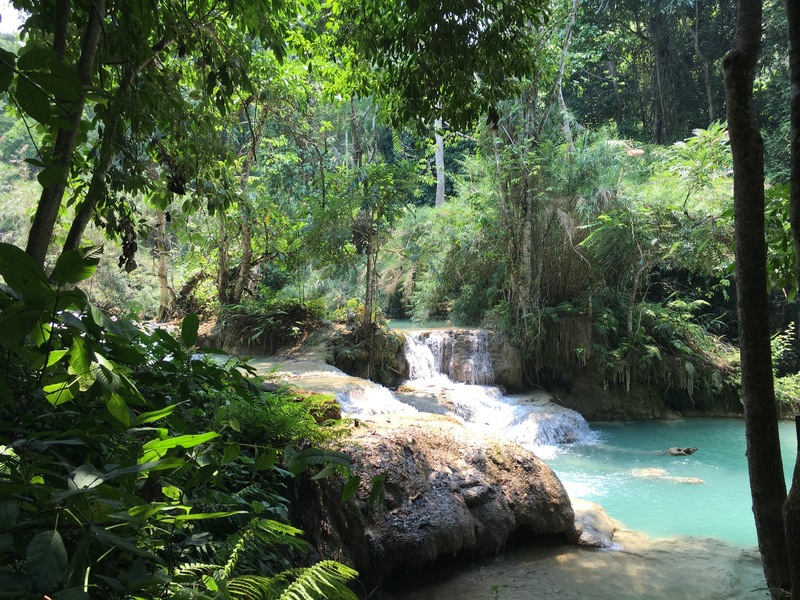 The Kuang Si Falls are stunning. No complaints when it came to Laotian food either. Is this real? Laos, are you a dream? I would have loved to stay in Luang Prabang for weeks (despite the struggling WiFi situation). But Bangkok was calling, and, as mentioned before, the money was/is running low. I needed to get back to a more productive routine. Only one week left here in Bangkok. I happen to be leaving the week that the “hot season” is finally breaking. 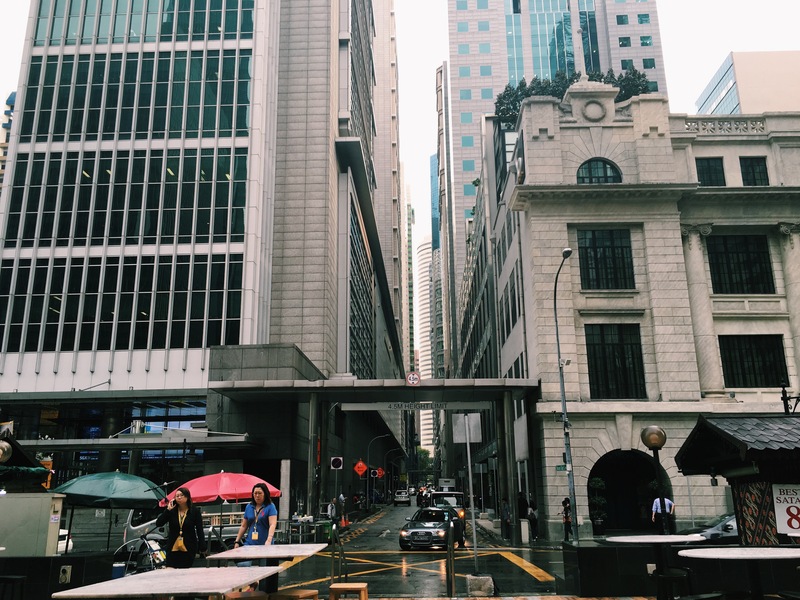 The heat wave is over, and rainy season is kicking off. It’s been HISTORICALLY SCORCHING since I got here, every day in April hit at least 100 degrees. But I lived to tell the tale! Anyway, now it’s time (but really…) to be productive and get some more invoices going. Freelance writing is like a marathon, and I keep taking excessive water breaks. Spicy AF Thai street food, bountifully available in my neighborhood. On Monday, I’ll be meeting my traveler extraordinaire mother in Vietnam for a week of fun in the sun (protected by layers and layers of sunscreen). Once we part ways, I’ll be headed to Korea and Taiwan. I booked a flight back to the United States, and I booked it on the Fourth of July. If that isn’t patriotism, I don’t know what is.